Rob went out for an Indian meal with friends last night and I stayed home for a quiet night in with the dogs, so I was cooking just for myself. I didn’t fancy spending ages in the kitchen just for dinner for one so I wanted something quick and easy. But there was to be no girlie, light snack for me, oh no. 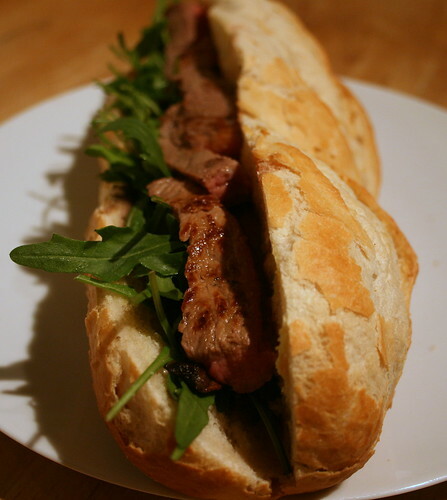 Instead, I went for a huge man-sized steak baguette with a fried and sliced Portobello mushroom (which you can’t see in the photographs as it was hidden under the steak) and rocket. I devoured the lot. It was glorious. The finest of all possible snacks I think. Did you have horseradish on it too? I feel it would be perfect with horseradish, the pure grated kind, not the creamy tame version. Hmm, not keen on horseradish myself, but for someone who does like it, you're right, it would go perfectly. It was so good, I'm drooling just thinking about it. My goodness. 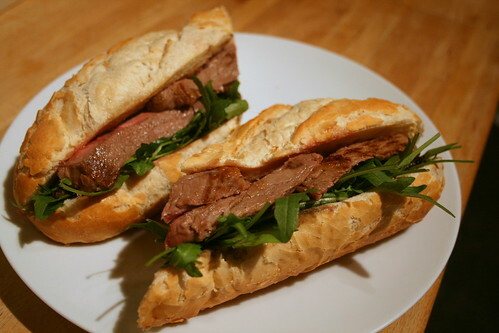 I haven't had a steak sandwich in years and would gladly eat that right now! Delicious. This looks delicious! I think simple but tasty meals like this are the best option when you cook for one. Oh boy, that looks delicious! That looks Wonderful!! Might have to put it on my menu for the coming week! 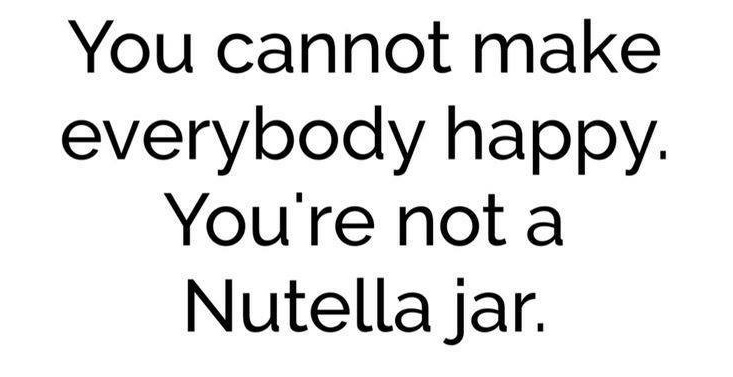 I'b be happy to eat with you the next time you're alone. Your photos are terrific and I suspect your baguette tasted every bit as good as it looks. wow che buono!! davvero invitante! It's very good and this log is lovely! 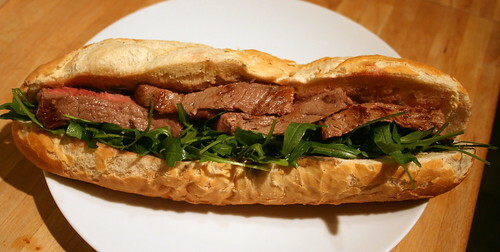 Was the steak's thickness any hindrance to eating it in sandwich form? I know others (mainly those from Philadelphia) slice their steak as thin as possible…not only for taste, but for ease of eating. Looks incredible though. I could imagine that a good compound butter would be amazing on this. This is my first time visiting your blog and I am very impressed! Great food, beautiful photos and lots of good information. Good luck with your cookbook … it will be fabulous. Cooking is very important to us, here at Skoog Farm. I have made so many Mushroom trying to find the perfect one. This could be the one. That baguette looks heavenly! I just discovered a Ham, Brie and Cranberry baguette down at EAT for lunch but that now seems like a tonka toy in a drag race compared to this. OMG, that sandwich looks so scrumptious! Looks amazing! I'm glad I stumbled across your blog! A fabulous collection! Yum, good eating alone choice! Just discovered your blog, looks lovely, and I agree with your choice for a single portion supper, who cares if it's not easy to eat, no one else there to see! Good luck with the book.